P-wave Velocity – Geotek Ltd.
Geotek offers two types of P-wave velocity sensor: ARC transducers for plastic liner whole or split sediment cores; and reciprocating piston transducers for unlined whole rock cores. The P-wave transducers are an innovative design of Geotek, constructed from materials to maximise signal to noise ratio whilst suppressing unwanted internal ringing and back radiation, providing good acoustic loading, and very high return losses. This results in a sensor with no detectable spurious internal modes and an extremely high back-to-front ratio (in excess of 60 dB). The centre frequency is 230 kHz, and the design achieves a Q-factor of lower than 3.5 as a result of the inherent material properties combined with careful attention to the mounting and matching. The sound beam is collimated by near field effects to core diameters of 100 mm. The high S/N (signal to noise) ratio resulting from the use of the lower frequency and good coupling, combined with the wide bandwidth, mean that precise repeatable and automatic timing measurements can be made, and they offer the option of further pulse processing in the frequency domain. 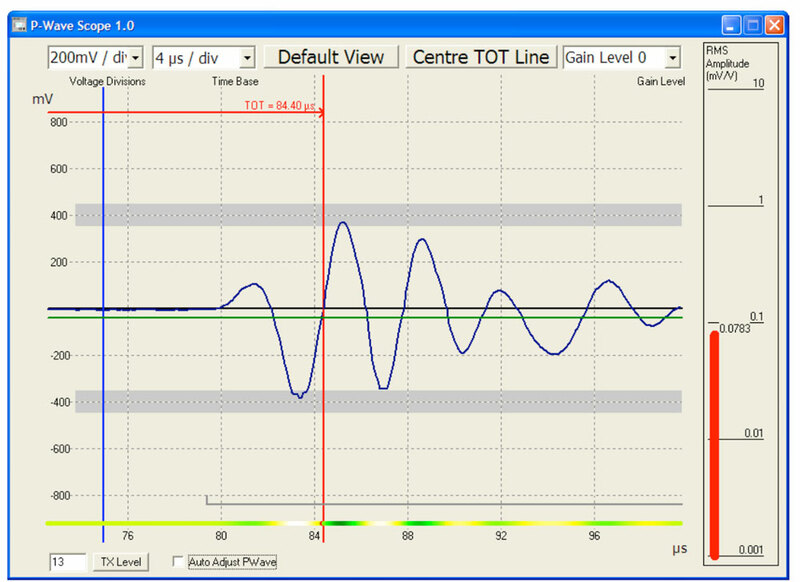 Other frequency ranges can be made to order. The Acoustic Rolling Contact (ARC) transducers for the Geotek MSCL systems incorporate the latest acoustic technology to achieve precise, high quality and repeatable results from cores of almost any composition in diameters from 50 to 150 mm. The ARC transducer uses a stationary active transducer element which is made from a unique polymer material that combines high coupling with relatively low acoustic impedance. ARC transducers couple directly to the core liner and hence do not require any coupling fluid between the transducer and the core liner. This eliminates the need for the user to wet the core liner and ensure that it stays wet during the logging process. Spectral analysis of the received signal from the new ARC transducers will enable sediment characterisation work because of their improved pulse and coupling characteristics. The stationary composite element is surrounded by an acoustic oil and a rotating soft deformable diaphragm. This arrangement enables the complete transducer assembly to rotate as the core is passed through the spring loaded opposing transducer pair. The careful internal design provides radiused internal locating lips which gives a wide contact area and positive repeatable location of the transducers over core diameters within the range 50mm to 150mm. 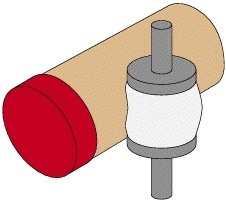 Reciprocating piston transducers are used for unlined whole rock cores. The piezoelectrical crystal is mounted within a stainless steel piston and is coupled with a specifically-designed contact pad and earthing circuit within the transducers to improve signal to noise ratio, even when the gain levels are high. 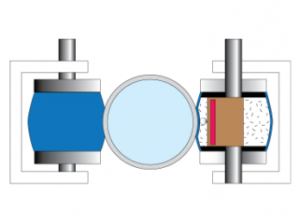 The piston transducers are driven by a motor, which automatically moves the transducers inwards to make contact at a consistent pressure and repeatable geometry on the core. The reciprocating piston P-wave sensors are compatible with core diameters between 50 mm and 150 mm. After each measurement the motors move the piston transducers away from the core to protect the transducers and sample from damage as the core is moved/pushed through the instrument. All reciprocating piston sensors are sold with three Geotek rock core logging trays/boats at one core size. If multiple core sizes are to be logged then it is recommended that multiple sizes of rock core logging trays/boats are purchased with the system.